Well, I finally got around to finishing my giant Sliding Barn Door Media Console! If you remember the dresser and bookcase components, you probably notice that I gave the entire piece a paint job. I did this because we decided to upgrade to a king bed and I wanted to stain the new bed that I was building with the new Briarsmoke stain by Varathane. The previous stain, on this piece, was Early American and it totally clashed with the Briarsmoke. I also wanted a good contrast between the barn doors and the console – so paint it was! Here is the piece with the barn doors shut. And here she is with them open! I built this piece for our master bedroom because I wanted to hide our TV and we needed the dresser storage. I love that when it’s closed, it looks like a decorated bookcase. Today, I’m sharing the plans for the bridge, that the barn door track is attached to, and the barn doors! You can find the barn door track that I purchased, from our fired Tyler Wayne, HERE! Building the Bridge – Print the free plans HERE. To start, I made all of my cuts for the bridge. Make sure to measure the span of your console from bookcase to bookcase to get an exact fit. After I made the cuts, I drilled 3/4″ pocket holes into the short 1×4 pieces my Kreg Jig. You can find our favorite Kreg Jig model HERE on Amazon. Now, they are ready to attach to the frame. Attach the 1×4 pieces to the long 2×4 frame piece with 1 1/4″ pocket hole screws and wood glue. Refer to the printable plans for correct placement of the 1×4 pieces. Here is the bridge after the 1×4’s are attached to the 2×4 frame. Next, attach the long 1×4 frame piece to the other side of the bridge. and attach it to the bridge frame with 1 1/4″ brad nails and wood glue. Then, attach the small piece of plywood, to the end, the same way. Now, to make the miter cuts for the trim pieces. Start with the long front pieces and cut off a 45° angle from one end. Then, hold it in place and mark where the second cut should be and make your cut. This will help give you the most precise cut. Attach it to the front of the bridge (2×4 side) with 1 1/4″ brad nails and wood glue. To cut the side trim pieces, make a 45° cut on one end, hold it in place and mark the other end where the cut should be. This will be straight cut. The bridge is done, time to put a finish on it. To do this, I cut scrap 2×4 pieces just a little shy of the width of both book cases. Then, I used my new Quiet Strike Pulse Driver to attach the 2×4’s to the studs behind the wall. The quiet strike is awesome! It works just like the impact drive, hammering and drilling at the same time so that you have to use less elbow grease, but it is much quieter. I use it whenever I am attaching anything to the wall! Studs are typically 16″ apart, so if you make your 2×4’s longer than that, you should be able to hit 2 studs. I used 3 1/2″ Spax screws to attach the 2×4’s to the wall. You can find these Spax screws HERE on Amazon. For one last added security, I attached the dresser to each bookcase. I did this by removing the drawers and driving 1 1/4″ Spax screws from inside the dresser, through the drawer cleats and into the bookcase. I did this a few times on each side, front and back of the dresser. Once the paint was dry on the bridge, I attached it to the book cases with 1 1/4″ Spax screws. Building the Barn Doors: You can print the free plans HERE! To build the barn doors, I started with sheets of 3/4″ Purebond Plywood. I used Birch because it’s the cheapest but it doesn’t matter which species you use. I had the hardware store rip them to size for me. and attached it to the bottom and top of the plywood with 1 1/4″ brad nails and wood glue. The edges of the trim should be flush with the edges of the plywood. Next, I measured and cut the side trim pieces to size and attached the the same way. At this point, I marked the very center of the plywood and drew a line from top to bottom. This will be the guide we use to make the cuts for the design. To measure for the first slats in the design, cut a 45° angle off of one end of a 1×4. Hold it in place and mark for the second cut. You can see where I put the marks for my 45° cut. Make the miter cut on the other end of the slat. Attach the first slats with 1 1/4″ brad nails and wood glue. Notice that I started with the second row of slats. I did this because I wanted them to meet at the very top center point of the door. and attach with 1 1/4″ brad nails and wood glue. Here is is so far. Now, you will mark for the next row of slats. This cut will be the same for the next 13 rows. When you get the the second to last row, mark and make cuts for that row, then attach. The bottom corner pieces will be cut from scrap 1×6. That’s it for the pattern on the door! Now to trim the sides! We are covering the sides of the door with 1×2, so that we can’t see the rough plywood edges and because it gives a nice clean look. Measure and cut the side trim pieces and attach them with 1 1/4 brad nails and wood glue. The edges of the 1×2 should be flush with the side of the door. Then measure for the bottom and top trim pieces and attach the same way. That’s it! Now, just give it a nice sanding all over. I used a 120-grit sanding pad on my Ryobi 18V Orbital sander. For the finish, I applied one coat of Briarsmoke stain by Varathane. I used a lamb’s wool applicator to apply (this is our very FAVORITE tool to stain with when we are staining large pieces. You can find them at Home Depot with the stain). Let the stain sit for about 5 minutes, then wipe the stain with a clean cloth, blending as you wipe. *Tip: We have heard it is hard to find Briarsmoke in most areas. You can get the same look mixing Weathered Gray and Dark Walnut 50:50. You can find a variety of Varathane stain colors HERE on Amazon. Varathane is our favorite stain to use because you don’t need to use a wood conditioner prior to staining and it is dry to the touch in about 1 hour! I bought the barn door hardware from our friend, Tyler Wayne. He is a local metal worker (Dallas area) and he designed this hardware to fit this console. You can find the hardware for sale on his Etsy shop HERE. First, I decided exactly where I wanted my doors to be hung. I wanted them to stop right at the bottom of the face frame, just above the toe kick. I measured the height of the door, marked that, then I gave a few inches for door straps. I marked where I wanted the wheels to touch the top of the barn door track and using my level, I drew a line from one side of the console to the other. I would install the track right under below this line. Next, I marked the holes in the track. I removed one wood screw and placed a spacer behind a bolt hole. Then, I drove the bolt into the barn door track, into the spacer and though the front of the bridge. I used my Quiet Strike with a hex bit for this part too! I did this for each hole in the track. The stops face in so that the are on the inside of the hex bolts. I attached the wheels and hung the doors on the track. You can see in this picture that I also attached guides to the bottom of the console. This keeps the doors from swinging forwards and backwards. That was it! Lots of steps but not too hard at all! What size tv can you fit into this? This is beautiful! My husband and I would like to build, but I can’t seem to find a complete set of plans and the links I find aren’t working. Any thoughts? Thank you! Does this show all the lumber that you need? I’m wanting to build this but can’t seem to find the actual plans for the whole thing? Where are the actual handles you use from? I don’t need the barn door sliding, just looking for handles similar to these. Where do you reside? I can make this for you with a 25% deposit for materials. Joel I am looking for someone to build this for me in Carrollton Texas where are you located? 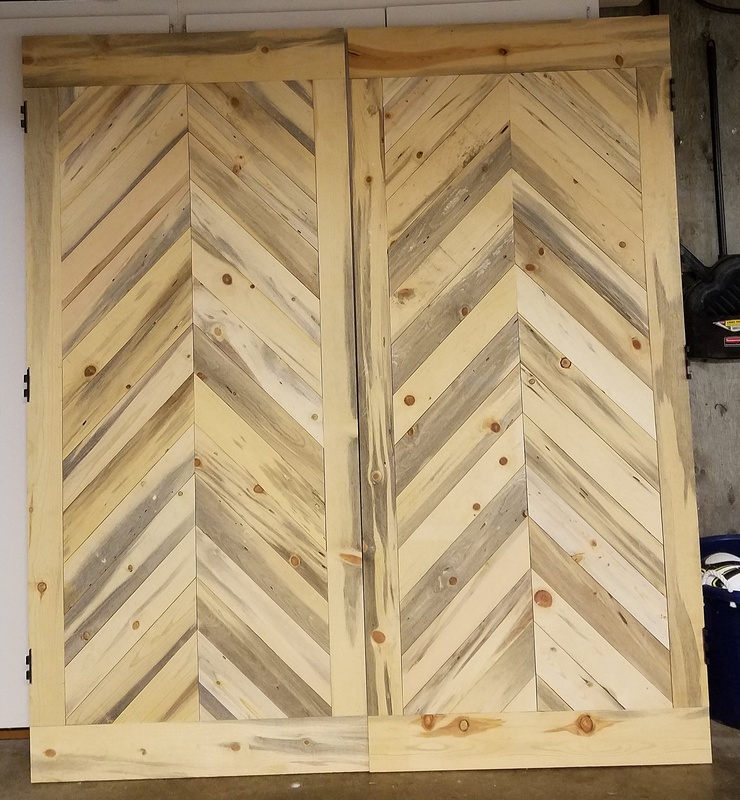 I used the barn door design as inspiration to make them into pantry doors. I used blue pine wood I found at a local lumber yard. I absolutely love your work! How high are your ceilings? Would this work with 10ft ceilings? Hi there – i am IN LOVE with this media center. However, living in a small NYC apartment, we do not have the tools or space to build this. Any suggestions/plans on how to build this out using Ikea pieces? Just curious as to about how much this project cost for all the wood materials and hardware? We are just about done with our project and it cost just over $1,000 in materials and hardware. Love this Ladies!!!!! <3 Do you think this can be modified with a murphy bed behind the doors? Beautiful! Do you mind sharing the cost of materials for the door and hardware? Thanks! Hello! 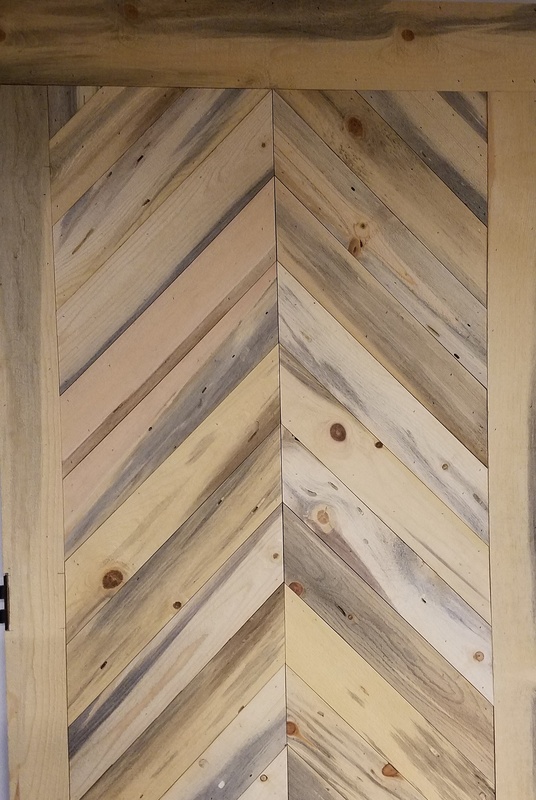 We have been so excited to build these barn wood doors! We purchased the 3/4 inch Birch Plywood as your instructions call out but it warped on us the day we brought the wood home. Do you ever have issues with this happening? If so, how do you recommend handling it? Currently our wood is bowing out ~1 inch. Do we need to get the wood completely straight before beginning our project? none of the photos are visible. I really would like to build this piece, any help? Suggestions on the best way to modify down this plan to fit a space that is 80 inches wide? These are amazing! I am planning on making the book cases this weekend and the rest as time allows. However, I wanted to have adjustable shelving. If I follow your directions but use the Kreg shelf pin jig to make the shelves adjustable, in your opinion, would these shelves hold in the plywood? Or should I use thicker plywood? I am unable to find the link to the handles for this console. Can you provide? Thanks!! Link to hardware is not working for me either. It’s not doing anything. Usually the word “Here” looks bold. It is not bold and nothing happens when I click on it. I’m not sure why. It is bold and green on my end, like usual links. I replied above with the link. Hope that helps! Hey! They link to the etsy shop for barn door track isn’t working and when i search his name on etsy…. barn door hardware isn’t what’s showing up:( Starting soon will take me a few weeks but need the link asap! I’m sorry, it’s working for me right now?? This is kinda freaking me out! My husband and I were cleaning house yesterday and I said I hated how the two built in shelves next to the fireplace always seem cluttered from all the TV equipment/surround sound pieces. He suggested sliding barnwood doors!! AND now your post with directions??? It’s meant to be ♥ Those doors look amazing! Eternally Grateful!